An app which uses Near Field Communication (NFC) technology to deliver instructional videos to young people with learning difficulties, helping them to live more independently. 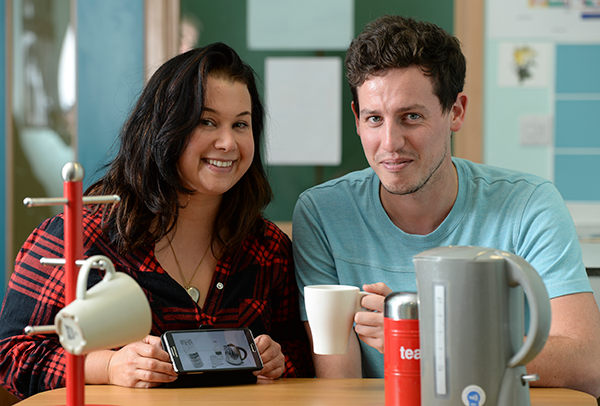 The app offers step-by-step guidance on how to complete everyday tasks, such as making a cup of tea or using an ATM. When an NFC-enabled phone or tablet is tapped against a distinctive HowDoI? sticker, placed on any object, it automatically launches an instructional video relevant to a particular task. For example when you tap the sticker on the kettle, a step-by-step instruction video on how to make a cup of tea is launched which the user can follow independently and at their own pace. The team are excited to start rolling the app out with other instructional videos to promote independent living, and apply the concept to workplaces where employers could use the it to help support employees with disabilities. The aim of the Inclusive Technology Prize was to inspire technological innovation from individuals and small businesses to improve or develop assistive living aids, adaptations, products and systems that will make a real difference to the lives of disabled people. Swiss Cottage School’s Taryl Law and Tom Casson; school governor and co-founder of assistive technology firm Alcove's Alexandra Eavis; and Mike Burgess, co-founder of digital agency Bam mobile. The original idea for the How Do I? app came from Tom, Leader for Lifelong Learning at Swiss Cottage School, Development and Research Centre – a specialised school for young people with special educational needs. Tom thought that step-by-step guides were a good way to help the students to learn independently, at their own pace, while boosting confidence. Once the idea was worked up by him and Taryl, they partnered with Alexandra and Mike, bringing diversity of skills and experience to the team. The team are using their semi-finalist prize to develop the app and improve the instructional videos offered. They’ve spent the last few months refining both the technology and the videos based on extensive user testing sessions with students at the Swiss Cottage School. How Do I? was also awarded an additional £15,000 at the Inclusive Technology Prize awards ceremony in March 2016.